Overwhelmed by over the counter rewetting drop products? You aren't alone. My patients repeatedly come in confused by the selection on the shelf, and often using the completely wrong product for their personal ocular needs. If your eyes are dry, watery, scratchy, irritated, red, filmy or just overall uncomfortable, you likely have dry eye. A trip to your local eye doctor can confirm this diagnosis. But what eye drops should you be using to combat this dryness? Not all products are created equal, and Retaine MGD is definitely one of the best choices out there if you are suffering from chronic dry eye or meibomian gland dysfunction. Not only is it preservative free (meaning no irritation from the harsh preservatives bottled eye drops require to keep pathogens from growing inside), but its chemical design is made to provide the best lasting comfort of any over the counter drop on the market by simulating how our natural tear film attracts to the surface of the eye. Note the slightly whitish hue of the drop inside? That's because this product isn't water or saline but an oil-based emulsion that's made to act like a restorative version of your own tear film. 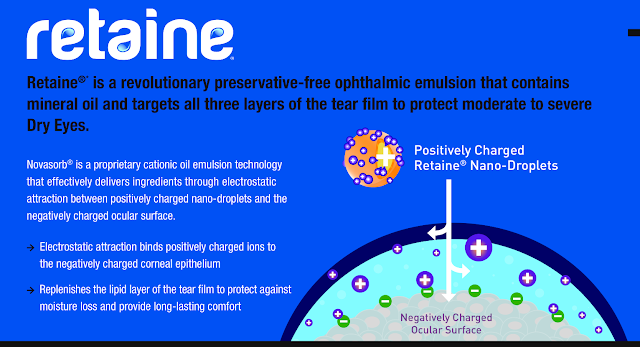 Retaine MGD is an ophthalmic emulsion which separates it from the other liquid and gel based tear drops you've been using in the past. 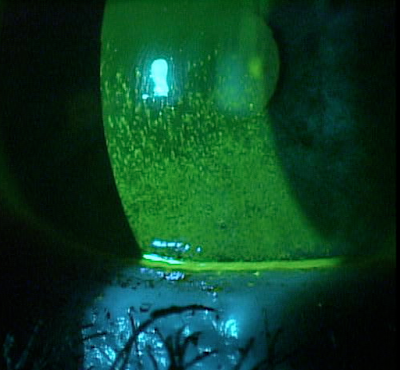 Emulsions are oil or lipid based, just like your normal tear film which is made up of oil and lipid secretions that are released from the meibomian glands in your top and bottom eyelid with every blink. This is why saline or water are terrible to use for dry eye -- your eye doesn't need water (and especially not salt water!! ); it needs something as close to natural tear film as possible. Just like our natural tear film, Retaine MGD's lipid emulsion uses electrostatic attraction to bind to the corneal epithelium, spreading evenly and staying there to provide the relief your eyes are craving. But it's not just scientific theory; it's proven to work! A 2015 clinical study followed 42 patients previously diagnosed with dry eye over the course of just 2 weeks. Subjects were instructed to insert 1-2 drops of Retaine MGD twice daily, once in the morning and once before bed. They were instructed to keep a record of how their eyes were feeling before putting in the drop at each application. 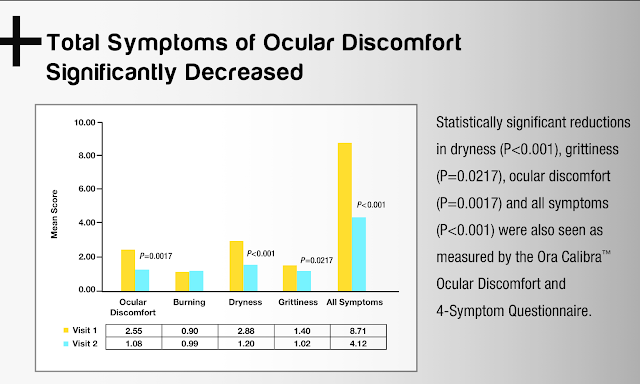 At the end of two weeks, patients had statistically significant reduction in their pre-treatment signs and symptoms of dry eye, including ocular surface fluorescein staining, conjunctival redness, and self-reported symptoms of "dryness," "grittiness," and "ocular discomfort". Patients also reported statistically significant improvement in their ability to work on a computer at night. Other quality-of-life indices also showed improvement at the end of the 2 week study, including the ability to read at night, drive at night, and watch TV at night, but these improvements were not statistically significant. 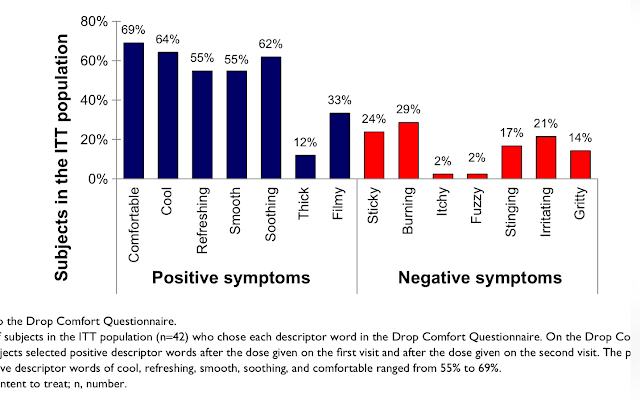 So we know using the drop just twice a day improves the clinical signs and the symptoms of dry eye, but what did people think about the drop itself? Many products for dry eye, both prescription and over the counter, come with significant comfort complaints -- meaning patients don't actually like to use them. That's a problem if we're trying to get a product to work; it won't do anything sitting in the back of a bathroom drawer. But this study showed that patients found Retaine MGD both comfortable and non-invasive to vision. Only 2% of study participants used only negative words (listed in red below) to describe their experience with the drop. As a side note, you can see many people listed burning as a side effect, despite the fact there are no preservatives in this drop. 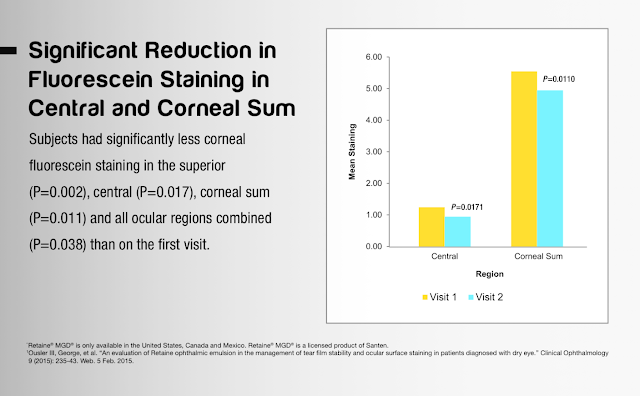 Just goes to show you that people with significant dry eye are super sensitive to anything coming in contact with the ocular surface (just look at that picture of corneal staining again if you are wondering why that is). 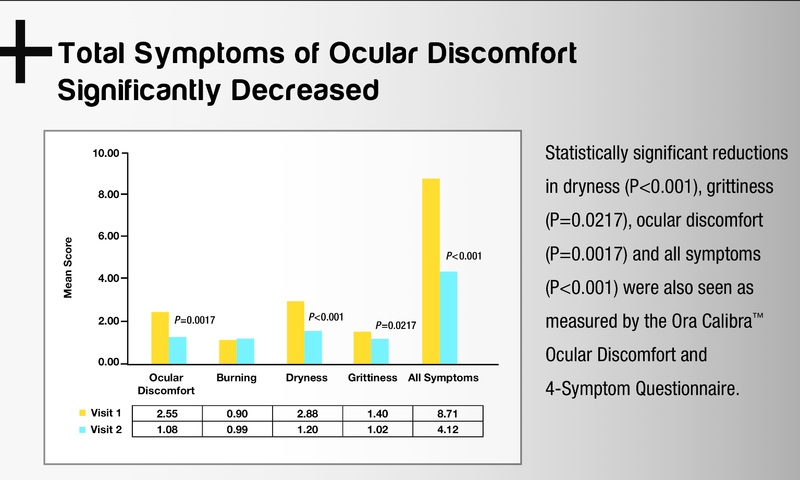 I tell my patients that if this drop burns, it means their eyes are so badly damaged by dryness that even the gentlest product is going to feel sensitive to them, and if they stay diligent with using their prescribed dry eye treatment we would expect sensitivity to improve as the ocular surface begins to heal. What's even better about Retaine MGD? It's doctor recommended but you don't need a prescription. 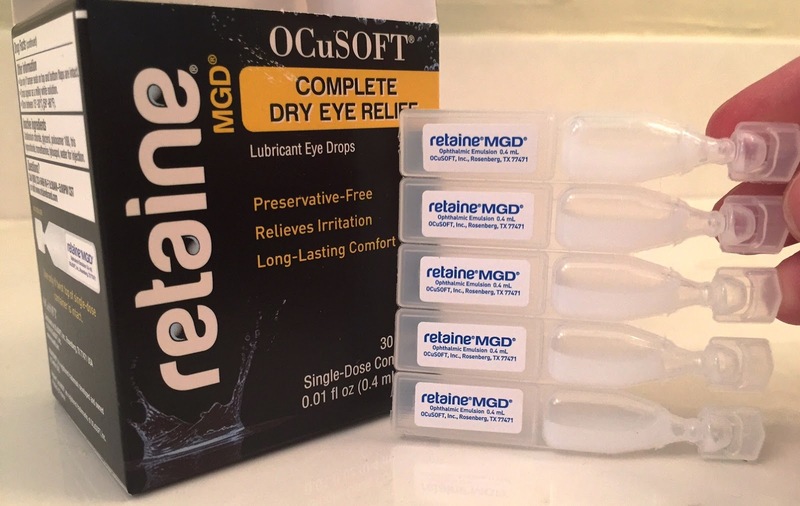 You can pick it up from your local eye doctor's office if they have an account with OCuSOFT, at your local Walgreens (and soon to be available in CVS), and online direct from OCuSOFT's website. The vials are also now re-capable, which means you can use the generous amount of drop inside each vial for your all day dry eye needs. Just used twice a day, you can expect significant results in only 2 weeks. Take the challenge for yourself and feel the difference! 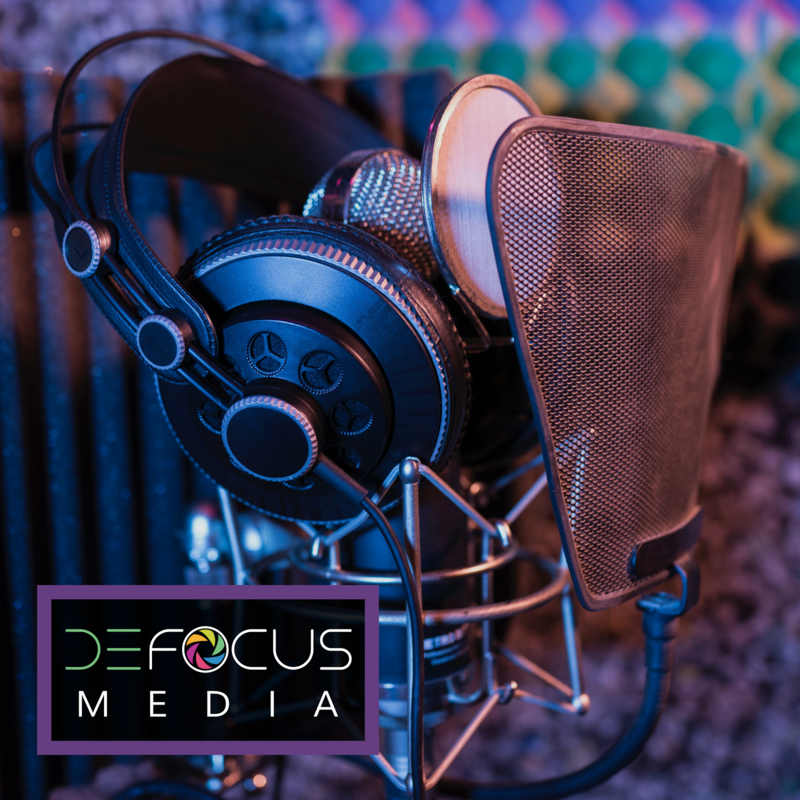 Disclaimer: OCuSOFT did provide me with samples of Retaine MGD for the purpose of this article and currently serves as a Platinum Sponsor for Eyedolatry. All opinions written in this article are my own. Tags: artificial tear, blurry vision computer, Dry Eye, optometry, over the counter drop, retaine MGD, rewetting drop, what drop should I buy for red eye?